The juncture of pedagogy and art, the need to enter the public, the desire to enrich the musical environment, i.e. the city of Sarajevo and Bosnia and Herzegovina with new musical contents, the need to prove the worldliness of the institution, all these resulted in the establishment of the festival entitled May Music Festivities (MMS). The MMS Festival began in 2008; initially, it was conceived the 53rd anniversary of Academy's establishment, and in the nine editions so far it has offered a few dozens of concerts which features students, teachers, and a number of guests of partner academies from the region and European countries. However, the true reasons of establishing the May Music Festivities festival were an urgent need for the public presentation of Music Academy teachers and students' art on the one hand, and appearance of Music Academy as an artistic institution at the local and international cultural stage on the other. The distinctiveness of the May Music Festivities concept is reflected in the presentation of the rich artistic and scientific activity of all Academy departments. 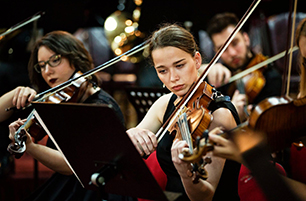 Performances by students, professors, academic ensembles such as String Orchestra, Symphony Orchestra, Mixed and Women’s Choir, “Etnoakademik” ensemble are woven into various forms of public performances, starting from all-evening recitals, concerts of chamber character to concerts of mixed type. 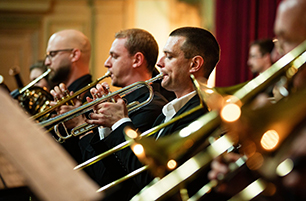 The program repertoire of MMS is focused on representative artistic achievements that follow world and European trends in the area of musical life. In this way Music Academy strives to send the message to BiH and broader public that it is a higher-education institution whose aim is to selflessly share the results of its artistic work, all with the desire to promote the music art in line with first-class aesthetic standards.